Whittley’s Sea Legend range is a little less well known than the builder’s cruisers but, like their stablemates, they are superbly well fitted for their intended task. They are about as close to the epitome of all rounder as anything afloat. To suit varying interpretations of all rounder a wide range of options is on offer, to the extent that the larger Legends can come close to resembling the cruisers. The big difference will remain the hull shapes. The Sea Legends are leaner and sharper, the cruisers having bulk in their hulls to swell the accommodation. 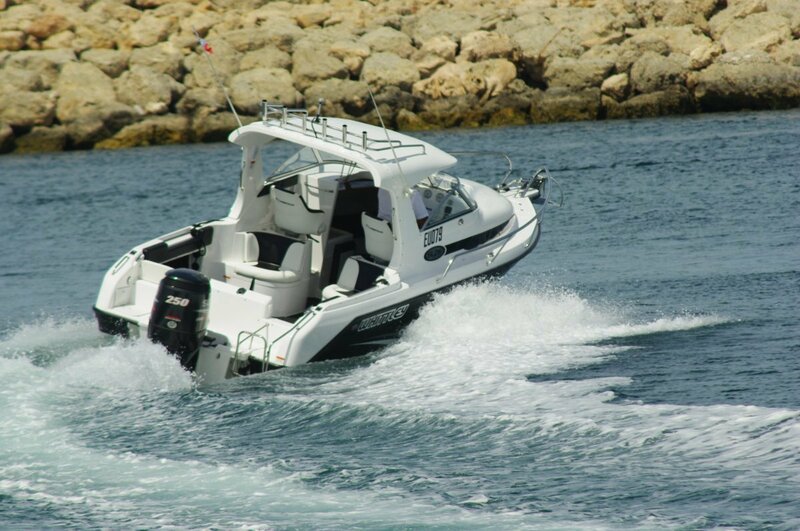 The review 26 Sea Legend was well optioned up, all the extras adding capability and convenience. The most obvious was the replacement of Bimini with open hardtop, an elegant structure offering indefinite life; also the rare and welcome presence of an overhead fore and aft grab rail. It comes with clears and storm cover, able to turn the cockpit into a virtual cabin. The cockpit is large, as you would expect from a 7.3 metre hull length. Aft of the seats all is clear once the rear lounge is folded; four or five anglers would be able to fish without bugging each other too much. Coamings are padded and clear of snags. Aft and midships cleats (the latter a useful standard feature) are tucked out of the way, the grab rails recessed. On family days solid numbers can be carried. The driver’s and navigator’s seats are mounted on locker spaces incorporating aft facing jump seats; optional quarter seats clip in alongside the settee to accommodate a total of eight. With numbers like that on board a decent plumbing system comes into its own. Within what, externally, appears to be a smallish cabin dwells a generous sized cubicle containing a flushing toilet. In an extension of domesticity a galley is located on the opposite side. And not a toy one: it has a two burner stove, a sink, a fridge and enough space to actually prepare food. There is room left over in the compartment for a pair of full length bunks, and the whole space is well lit by side glass and a clear fore hatch. An all rounder is at least partially a fishing boat and Whittley take the task seriously. Live bait tank, catch tank, deck wash, tackle drawers, rod racks and sockets are all included as well as a competent Lowrance sounder-plotter combo. The screen for that is part of a very well laid out dash. The screen is immediately above the wheel with banks of switches below it. The analogue engine gauges are at the base of the windscreen, closer to the eye line, and the compass above that. Everything is where it should be, visible in order of importance. The 26 was thoroughly powered by a 250hp Suzuki four-stroke. Thoroughly is the word. You could get away with less, but the hull can so obviously cope with, relish even, 250hp or more that it would be a pity to deny it. This is a fun, stimulating boat to drive giving a feeling of immense solidity. Whittley is Australia’s most awarded boat builder and evidence of why shows up in so many ways. Everything that could be moulded has been, meaning smooth, easy clean surfaces. The number of moulds involved in this boat is stunning; each of them clearly the result of much design time. The equipment level too is high including a power windlass and the twin batteries that so obviously complement it. The thoroughness extends to the trailer. This is the only one I have come across with integral tie down straps. They wind up on winches similar to truck tie downs. This completeness of boat, motor and trailer weighs in at comfortably under three tonnes: a wide range of vehicles can cope with this.